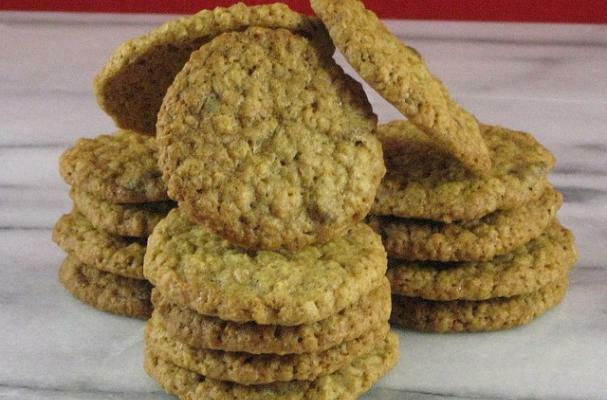 Walnut oatmeal cookies are an easy and homey cookie for the whole family to enjoy. These cookies require no fussy ingredients or techniques, you just mix and bake. I sometimes add chocolate chips. Walnut oatmeal cookies are perfect for those days when you just want to keep things simple. In a smaller bowl mix together flour, oatmeal, baking soda, and spices. In a large bowl mix soft butter and light brown sugar until well combined. Add egg, molasses, and vanilla, and beat until light and fluffy. Add flour mix and combine well until all the flour mix is completely moistened. Stir in finely chopped walnuts with a wooden spoon. Drop the cookie dough with an ice-cream scoop onto un-greased cookie sheet about 2 inches apart. Flatten cookies with a bottom of a glass to 1/2 inch thickens. Cool slightly and enjoy with a cup of cold milk. Store the remaining cookies, if there are any left, in an air tight container after they are completely cooled. Tip: I always cover my cookie sheet with aluminum foil, so I'm more quickly done with the clean up after baking and I have more time to spend with my family exchanging our events of the day, playing some games and sweetening up with cookies and milk. Just one teaspoon of oatmeal?